This is an album to take in small doses. The thing about it is that it is really pretty good but it gets tiring after a while, there are several tracks here which I really like and would sound great in almost any DJ set. Repeated listenings make it a bit boring, however. The kind of dark sophisticate sound of the album works really well, and the track Don't Die Just Yet, a clear cover of a Serge Gainsbourg song is a more than knowing nod. It tries to approximate some of the ambience that Gainsbourg explored in Histoire de Melody Nelson while transporting it to a New York context. It is partly successful in what it attempts to do. The voice samples that Holmes recorded in the streets of New York make a great effect in the album's overall mood. These elements make it approach the level of goodness of Barry Adamson's soundtracky albums, it does not quite get there, however. 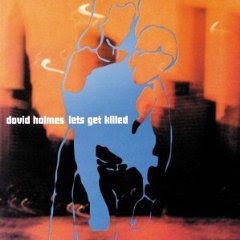 Holmes used the recordings he made in New York of conversations and other street-level noise as samples on the album. These snippets of conversation were often spoken by people from New Yorks cultural underbelly, including prostitutes, pimps and drug-dealers. The samples were used in between the tracks on the album,and in some cases in the tracks themselves.